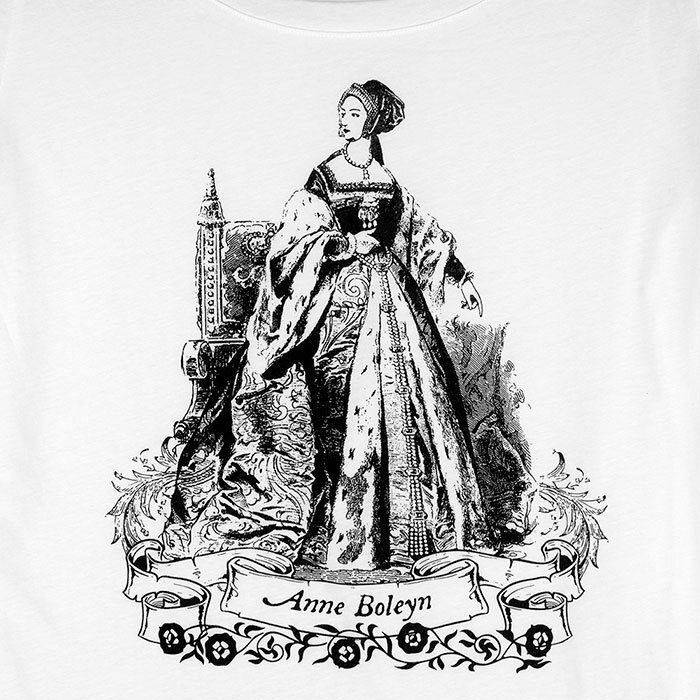 This T-shirt features a design of mine based on a vintage engraving of Anne Boleyn. This shirt is on sale as Bella does not make this shirt any longer. I only have a few sizes and colors left. Notes: These shirts are cut slim and they run small. They have a very stylish yet casual silhouette. I personally love the way they fit and have had many customers that love this shirt. I wear a small and medium in most shirts and I prefer to wear a medium in this shirt. The medium looks great but is cut slim. Just be aware this is not a flowy shirt even if you size up. Design is printed in black on an elbow length sleeve, 100% Fine Jersey cotton shirt in white or light pink. Feminine slimmer fit with extra length. These shirts are cut slim. I personally like the way this shirt fits but it might not be for everybody.